Last September during the MIBF, I stumbled upon a local author name Tara Frejas, who immediately made to my list of to look-out for writers. I love her quirky way of romance writing plus she packs all this “kilig” or giddiness in just a short novel which you can consume almost instantaneously. You’ll find yourself binge-reading her works all in one lazy Sunday afternoon. 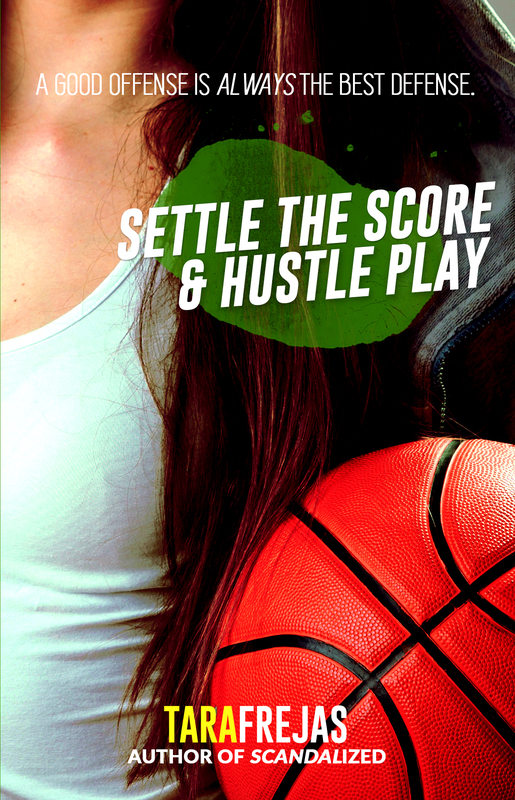 Since I stalked her on Twitter and Goodreads, it was kinda natural for me to find that I signed-up for the promotional blog tour and launch of her newest work: Settle the Score / Hustle Play, a sports romance that is as exciting and heart-pounding as your favorite collegiate basketball finals match. I kinda wanted to be one of the first to read her latest book and see what other kinds of magic Tara Frejas has under her sleeves. College senior Garnet Figueroa lives and breathes basketball. A reliable asset to her varsity team, she is equipped with the skills and smarts to get the De La Sierra Lady Hunters closer to this year’s championship title. But Garnet soon finds out that her good friend (and long-time crush), cheer dancer Charles Crisostomo, is being cheated on by his girl, and she lets her emotions get the best of her. Will she be able to come up with a game plan to save herself from heartbreak before the buzzer signals Game Over? Running on pure adrenaline and working with game strategies is something a basketball player like Garnet Figueroa is trained for. On the court, she is unbeatable. Off the court… that’s a completely different story. Because falling in love is trickier than a ball game, and Garnet finds herself fumbling over her feelings for Charles Crisostomo. The fact that her attention gets divided between him and rival school hard-court hottie Chris Barcelo doesn’t help. I’ve always been intrigued with best friends-turned-lovers stories. I like reading about how a friendship which solidifies into a stronger bond eventually flourishes into a different kind of love. My fascination stems from how writers are able to maneuver these different layers of feelings and complications which constantly arises from such situations. So when I read that Settle the Score / Hustle Play is mainly about that, it really captured my interest. I really like how Tara Frejas can create colorful backgrounds for her leads, given that her works are short novels. To be able to establish these characters and their values is a tough feat especially if you have a limited number of pages to work with. And just like with her other books she can also write a solid set of secondary characters to add to the dynamics of the story. I love how Charles and Garnet’s friendship was introduced and how it bloomed into a deeper bond. The collegiate athletic backdrop also gives a different layer of drama to the story. Maybe because I’m still reeling from her other book The “Forget You” Brew, but I felt that Settle the Score / Hustle Play lacked something I just couldn’t put my finger on. There were a couple of unresolved scenes for me which would’ve made the story a bit more seamless. I also wish there were more “kilig” or sweet moments between Garnet and Charles.